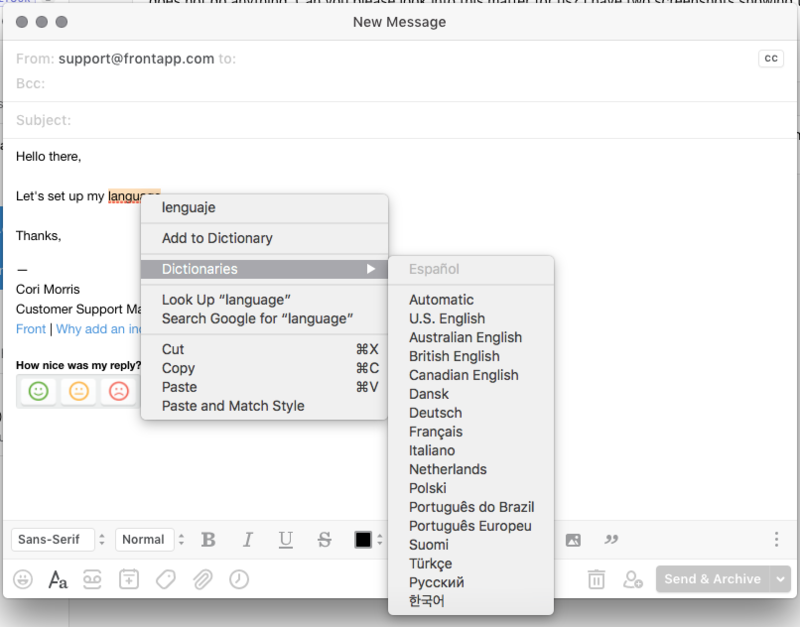 Front offers spell check in various languages. 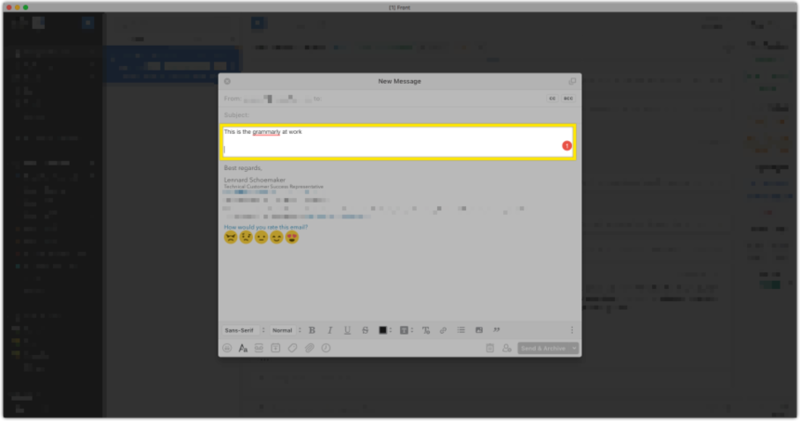 Highlight a word in your composed email. Hover over Dictionaries to expand the list of supported languages. If you have a language selected, spell check will underline the misspelled word, but not change it automatically. Right click the misspelled word to choose the corrected word. Note: On some Windows machines, you may need to add a language to your dictionary. To do this, go into your computer Settings and select Region & Languages. Cori Morris There is a workaround that we use here at the office. We really wanted the Grammarly Extension to work but we did not want to use a browser to access Frontapp as having a separate app just works a lot nice. Is there a system setting we can change to specify using a UK language for spell check? Unfortunately not. The above information is really all there is to say on spell check. Does Front also do this when logging in through the site in stead of the Windows App? I use OS X (10.12.3) and Front is up to date (3.3.7). When I right-click in the composer window in Front I can´t find Spelling and Grammar or something similar. Also the keyboard-shortcut to Spelling and Grammar does not work. Sorry for the misunderstanding. We just recently launched a new version of the Mac app, and unfortunately, this is not relevant anymore. We are, however, working on improving the spell check feature. I will update this article now. Thanks for bringing it to my attention! Hi, Any progress on this? Being forced to use US spelling is not making my day! Mac OS and Frontapp all up to date. Graham Stacey Check out this guide for help. Hi, can you fix the OSX spell checker so it works like in all other OSX apps? Ram Hi! The team has been very busy with some larger features, but we're hoping to fix this soon. Ram Totally understand. We're hoping to prioritize this in our next stabilization week. However, the Grammarly plug in should work with the web app. Some of us use it here actually. hmm, it's working indeed. But not in the composer pop up. Ram Oh, ok. Because it's an extension to your browser, we can't help debug this. Ram You're saying that the Grammarly extension isn't working in the pop up, right? That's not something we'll debug since it's an extension. An integration with Grammarly would be a game changer for everyone. Chaz Unfortunately, Grammarly doesn't have an open API for us to build an integration at this time. The automatic language detection options does not some to work anymore since the last major update.